Westhaven Commences Ground Geophysics on Its Shovelnose Gold Property | Energy and Gold Ltd.
VANCOUVER, B.C., Nov. 19, 2018 (GLOBE NEWSWIRE) — Westhaven Ventures Inc. (TSX-V:WHN) is pleased to announce that ground geophysics has commenced at its 15,542 hectare Shovelnose gold property, located within the prospective Spences Bridge Gold Belt (SBGB), which borders the Coquihalla Highway 30 kilometres south of Merritt, British Columbia. Westhaven has engaged Scott Geophysics Limited of Vancouver, B.C. 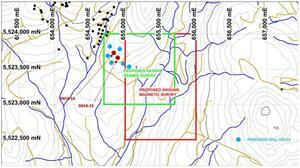 to conduct a ground magnetic survey and passive seismic survey at the Shovelnose gold property. A recently completed high resolution airborne survey outlined numerous magnetic lows throughout the 15,542 hectare Shovelnose property. The purpose of this ground geophysics program is to extend coverage to the south of the South Zone and better define potential structural trends within a newly identified vein system with wider sections of mineralization. The data from this magnetic survey will be used to assist in diamond drill targeting. The passive seismic survey will map out overburden thicknesses which will assist in targeting shallower portions of the South Zone vein system. Please see the map below for details on the survey. Westhaven owns a 100%-interest in 4 properties covering over 35,000 hectares within the prospective SBGB, which is situated within a geological setting like those which host other significant epithermal gold-silver systems. It is close to major transportation routes and infrastructure allowing for cost-effective exploration. The SBGB is a 110-kilometre northwest-trending belt of intermediate to felsic volcanic rocks dominated by the Cretaceous Spences Bridge Group. Sable Resources and Westhaven have a combined control of 86% of the SBGB (225,000ha). Any ground staked by Sable within 5 kilometres of Westhaven’s existing projects will be subject to a 2.5% NSR. In addition, Westhaven has a 30 day Right of First Refusal (ROFR) on any properties outside this 5-kilometre radius. Westhaven has granted 100,000 incentive stock options to a consultant to the company. The incentive stock options have an exercise price of $1.20 per share, are valid for a 5 year period from the date of grant, and are subject to regulatory approval. The Company’s Stock Option Plan allows for the issuance of up to 10% of issued and outstanding share capital in the form of incentive stock options. As a result of this grant, the Company has 8,050,000 stock options issued, representing 9.5% of the issued and outstanding share capital.